Our Dennis beach lifeguards make sure the summer season is fun for all by making our beaches safer. Be a Dennis-Yarmouth Regional High School student or a Dennis or Yarmouth resident at the Cape Cod Tech or Sturgis Charter School. Once you have taken the course, you are then eligible for tryouts to become a lifeguard and if you are hired by the Town of Dennis, bring your receipt for the certification class to the Dennis Chamber of Commerce and you will be reimbursed in full from the Lifeguard Scholarship Fund. 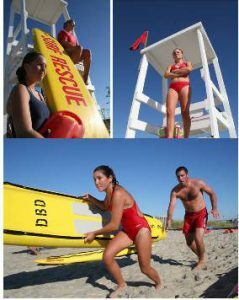 Below is a link to the Town of Dennis website; where jobs applications are posted to become a lifeguard. Town of Dennis Beach information town website. Please make a donation to the Dennis Chamber’s Lifeguard Certification Scholarship Fund to support the training of our Dennis beach lifeguards. Donations may be made at the Dennis Chamber Visitor Center at 242 Swan River Road, West Dennis or to PO Box 1001, West Dennis, MA 02670. Make checks payable to: Dennis Chamber Lifeguard Scholarship Fund.